A 13-year-old boy a model student? Yes, it's true, and Marina Village Middle School administrators and staff couldn't say enough good things about Ryan Parisek, the Rotary Club of El Dorado Hills' Student of the Month. "He's the first one to offer help," said Principal Jeff Warshaw, reading a letter from school counselor Myrna Harp. "He's one of those rare jewels schools wish all students could be." 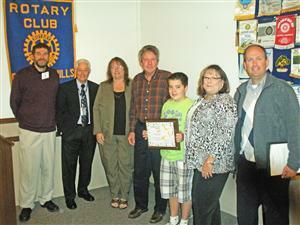 Ryan, an eighth-grader at Marina Village, attended the Nov. 2 Rotary Club meeting with his parents Ila and Matt Parisek. Rescue Union School District Superintendent David Swart also attended. For his efforts in the classroom and on the schoolyard, Ryan received a savings bond and a plaque from club President Jeff England.